No garage storage system is complete without a rack to hold your heavy equipment. 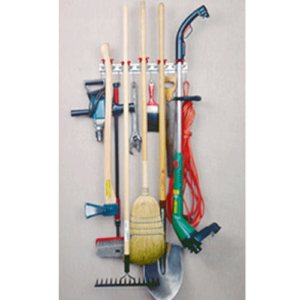 Our Heavy Duty Tool Utility Rack allow you to store heavy and cumbersome tools like chainsaws and snow blowers. 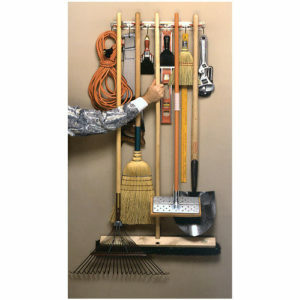 Load up the sturdy hooks with your heavy equipment! Comes with 5 Heavy Duty Hooks! You can hang from 1 to 5 hooks on this rack depending on how much room you need between hanging items. 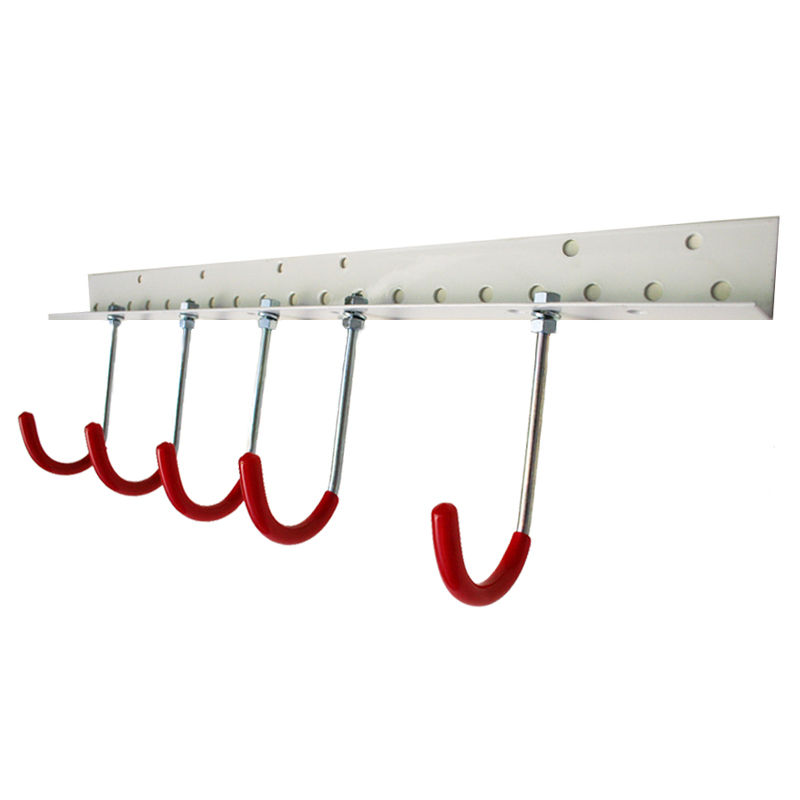 There are many hanging hook holes allowing you to hang hooks at different width intervals. 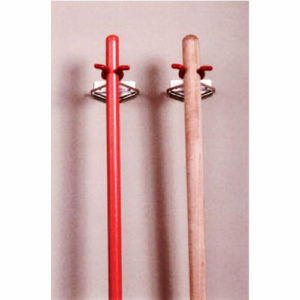 For example: You may add hooks closer together or farther apart depending on your needs. 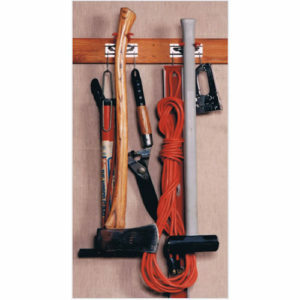 The Heavy Duty Utility Rack comes with all of the hardware you will need, including 5 heavy duty hooks and the bracket that is secured to a load bearing wall. Our heavy duty tool utility bracket can hold up to 300 pounds of your heavy duty equipment. There are no plastic parts to worry about durability, all parts are made of steel and metal, guaranteed to last a long time. Hang chainsaws, snow and leaf blowers, power washers, and much more. 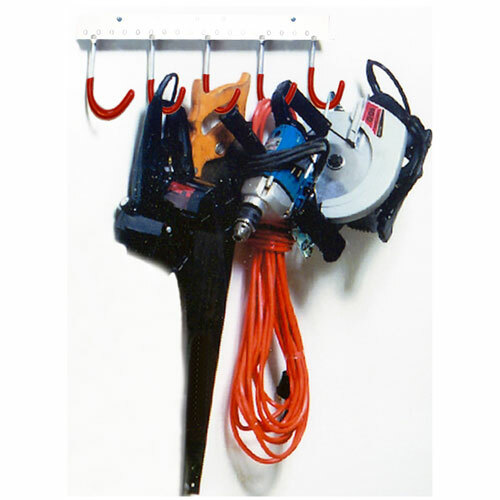 Our heavy duty tool utility bracket is designed to hang and suspend objects vertically, using our heavy duty hooks. Bracket must be installed to a load-bearing wall in your garage ( or an area of your choosing ). Failure to install the bracket on a wall capable of supporting the weight ( up to 300 pounds ) of the bracket and hanging objects, may result in significant damage to wall structures. Please take care in this regard. The Bill of Material is a list that contains everything you will receive, with the purchase of our Heavy Duty Tool Utility Rack.